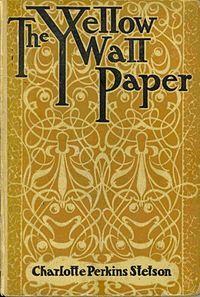 The Yellow Wallpaper is a short story, written by American author Charlotte Perkins Gilman (aka Charlotte Perkins Stetson), built on a collection of journal entries written by an unnamed woman and presented in the first person. 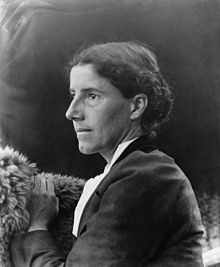 First published in January 1892 in The New England Magazine, it is regarded as an important early work of American feminist literature, illustrating attitudes in the 19th century toward women's health, both physical and mental. The story details the descent of a young woman into madness. Her supportive, though misunderstanding husband, John, believes it is in her best interests to go on a rest cure after the birth of their child. The family spends the summer at a colonial mansion that has, in the narrator's words, "something queer about it". She and her husband move into an upstairs room that she assumes was once a nursery, having it serve as their bedroom due to its multitude of windows, which provide the air so needed in her recovery. In addition to the couple, John's sister, Jennie, is present; she serves as their housekeeper. Like most nurseries at the time, the windows are barred, the wallpaper has been torn, and the floor is scratched. The narrator attributes all these to children, as most of the damage is isolated to their reach. Ultimately, though, the reader is left unsure as to the source of the room's damage. The narrator devotes many journal entries to describing the wallpaper in the room – its "yellow" smell, its "breakneck" pattern, the missing patches, and the way it leaves yellow smears on the skin and clothing of anyone who touches it. She describes how the longer one stays in the bedroom, the more the wallpaper appears to mutate, especially in the moonlight. With no stimulus other than the wallpaper, the pattern and designs become increasingly intriguing to the narrator. She soon begins to see a figure in the design, and eventually comes to believe that a woman is creeping on all fours behind the pattern. Believing she must try to free the woman in the wallpaper, the woman begins to strip the remaining paper off the wall. On the last day of summer, she locks herself in her room to strip the remains of the wallpaper. When John arrives home, she refuses to unlock the door. When he returns with the key, he finds her creeping around the room, circling the walls and touching the wallpaper. She exclaims, "I've got out at last,...in spite of you and Jane", and her husband faints as she continues to circle the room, stepping over his inert body each time she passes. Personal Note: Of all the various adaptations of The Yellow Wallpaper done to date, my personal favourite is the 1989 film produced by the British Broadcasting Corporation (BBC), later shown in the U.S. on Masterpiece Theatre. It was adapted by Maggie Wadey, directed by John Clive, and starred Julia Watson and Stephen Dillane. It's quite rare, but you might be able to find it on amazon.com and/or amazon.co.uk.